As noted earlier today, the Nordstrom Anniversary Sale is on, with early access to card holders. Every year they do it a bit differently — this year you can see the items without a card, but can only place them in your cart once you confirm your card number. Today through the 16th you can earn double points; you can also choose for today to be your triple points day if you really plan to do a lot of buying. I’ll do a separate roundup of shoes and bags later, but right now note that there are some great picks for reader favorite AGL (flats are now down to $210! ), as well as Cole Haan and Tory Burch. For the weekend, there are great sales on Frye, as well as these cute rag & bone booties (now marked to $350! ooh, and here’s a more affordable version from Ivanka Trump). For bags — nice selection of Rebecca Minkoff, Longchamp (Pliage on sale! ), Marc by Marc Jacobs, and Brahmin. If you need a new winter or fall coat, do check out the selection — I’m in love with these two DvF coats, as well as this bright blue Ted Baker coat (also available in black), and this Calvin Klein is an affordable take on the trend of boyfriend coats. For the weekend it looks like draped leather jackets are hot, and there are a ton in the sale in a wide range of prices — this affordable Trouvé leather jacket is my favorite. If you’re looking for an investment coat, this double breasted, below the knee, cashmere and wool coat from Nordstrom Signature and Caroline Issa is a classic. Great denim choices, including flares, skinnies, boyfriend styles from trendy names like Le Frame, Current/Elliott, rag & bone, and Paige, as well as Kut from the Kloth, NYDJ, Wit & Wisdom, Vigoss, and SEVEN different styles of reader favorite Jag pull-on jeans. Great shapewear, including Yummie, Spanx, and TC — and, ooh, the readers’ favorite pantyhose brand, Donna Karan’s The Nudes, is part of the sale. Tons of reader favorite Zella leggings and workout gear on sale. These Pleione wrap-front blouses are reader favorites — if you happen to be nursing it’s also a particular favorite of moms pumping at work. The short sleeved version pictured below is marked down to $42.90 and comes in seven colors, XS-XL; it’s hand-washable. (A longer-sleeved version is white is actually on regular sale for $19 though!) Also from the same brand: I like the look of this split-neck top (also in plus sizes), and this mixed media tunic is one of my favorites for the weekend. The Halogen Seamed Pencil skirt is a classic around here — it’s available in seven colors, sizes 0-16, regular and petite, for $45. This sweater skirt from Nic + Zoe with different tiers of pleats looks so, so pretty for work. It’s a pull-on style, hand wash, and available in sizes XS-XL for $91. This “Darling Dot” suit from Halogen looks lovely. The blazer is now $98, matching skirt is $45, and the matching pants are now $57. All three pieces are available in regular and petite sizes 0-16. I don’t normally think of Betsey Johnson for workwear, but this red fully lined ponte sheath looks great. It’s now marked to $104.90; it’ll be $158 after the sale ends. On the flip side, T Tahari is a brand that everyone loves for workwear — this dark gray sheath dress looks like a workhorse for $118. I also think this black and blue sheath dress (not pictured) looks like a fun dress. These BCBG wrap dresses are classics — this black and white abstract print is my favorite of this season’s bunch, but there are numerous prints available. They’re now marked to $131, which isn’t bad considering they’ll be $191 after the sale. Sizes XS-L, machine wash, tumble dry. Lots of good sales on Classiques Entier in general — this mixed media jacket looks like a fun suit; it’s $198; it will be $298 after the sale ends. (Here’s the matching skirt for $118.) Other great Classiques suits: this light brown one with a slightly longer jacket looks lovely, and this navy/glen-plaid suit comes in regular and plus sizes. Vince continues to nail the “simple basics” category, including this simple sheath dress with pockets, available in teal and black for $216 (it’ll be $325 after the sale ends). I’m surprised there isn’t more DvF in the sale, to be honest — as mentioned at top there are some insane winter coats of hers in the sale, and I like this “herringbone cornflower” wrap dress, now marked to $265 (it’ll be $398 after the sale ends). For the weekend, this midnight blue jumpsuit of hers (now $265) is perfection. WHOA, YOU GUYS. I have never seen Theory classic suiting combos in colors before. 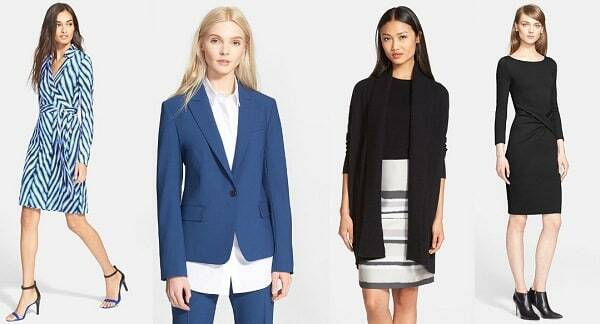 I’ve pictured the Gabe blazer in Pacific Blue (now $279; it’ll be $425 after the sale); you can also get the Betty sheath and the Emery pants. Long cardigans are everywhere this season, and this cashmere one from Hugo Boss is my absolute favorite. At $414 it’s still a splurge (it’ll be $625 after the sale ends), but: le sigh. (Here’s a more affordable long cardigan with a different vibe, and here’s a great one in plus sizes… totally unrelated, but I’m also drooling over this August Cashmere sweater for the weekend.) Also from Boss: this black sheath dress looks amazing. FINALLY: Armani. It’s a classic. This cross drape jersey dress (also available in blue) looks lovely. It’s $529 and available in sizes 2-16 — after the sale it’ll go back up to $875. All right ladies, that’s it from me for today — what are YOU getting in the sale? Any favorite brands or products I haven’t mentioned? I’m not sure that the black Classiques dress (third set, left) is actually intended to be blousy on top. It looks like the size needed for the model in the hips is just too big for her on top and they didn’t pin it. There are a few other photos where the model is clearly in a size or two too big (at least on top) and they didn’t even attempt to pin it. The last photo for the Lafayette 148 New York Square Neck Punto Milano Sheath Dress is really bad. As a pear, maybe I should be grateful that they’re freely showing how certain items are not made for my shape. I wish all the Pleione blouses looked better untucked. I love them except for that. have i missed something about PULL ON JEANS? (apologies to ellen for the all-caps) what are these things? they’re not maternity? i think i’m in heaven. Pull on jeans? Where did you see those? Delightful! I searched some of the Nordstrom styles and they are also on Amazon. I am looking for a bra that doesn’t have the metal clips on the back straps. Some sports bras meet that requirement, but they don’t have padding in the front. I am also look for soft cups without wire type. Can anyone recommend some brands? Soma Vanishing Back Front Close meets most of those requirements, but it’s underwire. They have several wireless options too.